Uganda is blessed with half of the remaining endangered mountain gorilla species in the world. These can be trekked during your gorilla trekking safaris Uganda in Bwindi Impenetrable National Park Uganda and Mgahinga Gorilla National Park. Bwindi Impenetrable National Park has over 18 habituated gorilla families that are available for trekking on your Africa safari while Mgahinga Gorilla National Park Uganda has one gorilla trekking family called Nyakagezi however, it is the only park with golden monkeys in Uganda and they are available for trekking. This was the first sector for gorilla trekking in Bwindi and most popular. Started in 1993, Buhoma is still regarded as the best Uganda gorilla safari experience sector. There three gorilla groups, Mubare gorilla family was the first group to be opened for gorilla trekking followed by Habinyanja (1997) and Rushegura (2000). Buhoma offers fly in safari options of either morning or afternoon rather than the southern sector that has only morning fly in safaris because of the weather. Ruhija gorilla trekking sector is regarded as the most remote sector of all the four. It is situated in the Eastern side of Bwindi impenetrable national park. The sector has three (3) gorilla families which are Oruzogo, Bitukura and Kyaguriro (for research purposes). This is the best sector for a bird watching safari in Uganda as you trek the gorillas. The sector is famous for abundant birdlife and a three-hour hike to Mubwindi swamp which is very rewarding for passionate birders alongside the gorilla trekking experience. It is the only place for sighting the African Green Broadbill in the whole of Bwindi. 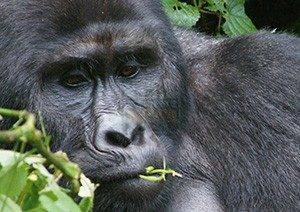 Rushaga gorilla trekking sector also located in the southern sector has six (6) gorilla families. The gorilla families in the sector are Nshongi, Bweza, Kahungye, Mishaya and Businge open for gorilla trekking. Bikingi gorilla group is open for a gorilla habituation experience. Rushaga gorilla family is situated between Kabale and Nkuringo. In regards to accessibility, by road Ruhija is closer, followed by Buhoma and then Rushaga and Nkuringo in Kisoro. A 4X4WD safari vehicle is recommended for a drive in the region of Bwindi impenetrable national park. Southern part of Bwindi impenetrable national park is Nkuringo gorilla trekking sector. Nkuringo sector was established in 2004 which makes it the second to be established gorilla trekking trailhead. It has three (3) gorilla families one for gorilla trekking. Nkuringo gorilla family is open for gorilla trekking and Bushasho is open for tourists who would love to have a gorilla habituation experience. Christmas gorilla group has been introduced of recent (August 2018) for gorilla trekking after great conservation efforts. Nkuringo gorilla group live at about 600m above sea level below the trailhead on Nteko ridge. Trekking gorillas in this sector is challenging and requires one to be physically fit, it is tough but so much adventurous. If you need a challenging gorilla trekking safari in Uganda then this is the best group to trek. You can enjoy more by adding a Uganda wildlife safari, Uganda chimpanzee trekking safari, a golden monkey trekking safari, Kampala city tour, Jinja city tour and many more to your Uganda safari itinerary.